The super-short USB Shortys® type 'A' extension cord can give rigid devices like thumb drives a flexible plug, or it can be used to eliminate overly long cables around your hub. Always keep a few around as they can be quite handy! 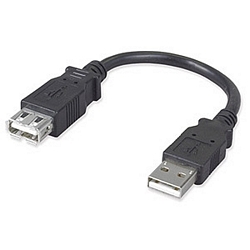 Compatible with USB 1.0/1.1/2.0. Including the gold-plated connectors, the overall length is 7 1/2".